Primary city and county of residence and work: Phoenix, Arizona; Long Beach, California; and Carson City, Nevada. In the 1920 census, Ada is shown as a widow living with her 8-year-old son in Long Beach, California. Contradicting the widow designation, however, was an article in the May 16, 1917 Weekly Journal-Minor of Prescott, Arizona which stated Celora Stoddard sued for divorce in the Superior Court and alleged Ada had deserted him. The “divorcee” designation was something a young woman might not want to have attached to her name in 1917 and for that reason alone she might have designated herself a widow. She was now 33 years old. On January 11, 1964, Donald J. Wallace passed away. Ada Van Sant Wallace was now 77 years of age. 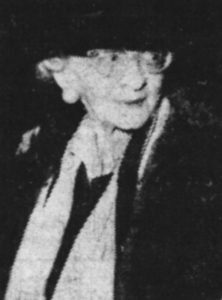 She remained in Carson City for a few more months but in early 1965 she returned to the Long Beach, California, area to be near her son James and wife Sylvia (Crowell) Blackburn Stoddard. One wonders if she continued painting. This author could find no evidence that she did. Perhaps when she left Carson City, she packed her paints and brushes away and ended that part of her life. 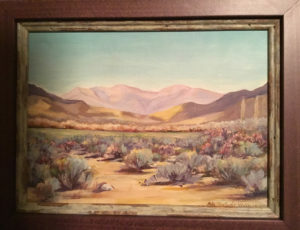 In 2018 while going through stuff in boxes that had been my mother’s (Naomi Bremenkampf Bernard), the author came across a small oil painting of the Nevada desert by Ada Van Sant Wallace. She decided to try and learn more about this unknown Nevada artist. Most of her contemporaries had passed away except for Kay Pozzi Winters who was kind enough to give a personal observation. Additionally, Charles A. Blim Jr., owner of the Charlie B Gallery in Carson City stated he occasionally came across paintings done by Ada VanSant Wallace and the paintings usually sold right away. Ada Van Sant Wallace passed away on October 4, 1978 in Pasadena, California. She was 91 years of age. A funeral was held at St. Peter’s Episcopal Church in Carson City and she is buried in the Masonic Section of the Lone Mountain Cemetery in Carson City, Nv. 1. Winters, Kay Pozzi. 8/10/2018 via telephone interview, Carson City, Nev.
3. www.newspapers.com, Reno Gazette Journal (Reno, Nevada) Sat. April 8, 1944, p7. 5. Winters, Kay Pozzi. 8/10/2018 via telephone interview, Carson City, Nev.
Ada Van Sant Stoddard and Ada Van Sant Wallace – https://www.newspapers.com Multiple articles from the Arizona Republic (Phoenix, Arizona), the Courier Post (Camden, New Jersey); Weekly Journal-Miner (Prescott, Arizona); Arizona Republic, (Phoenix, Arizona); Nevada State Journal (Reno, Nevada); Reno Gazette Journal (Reno, Nevada); Carson City Appeal (Carson City, Nevada) covering the period March 21, 1909 through October 7, 1978.